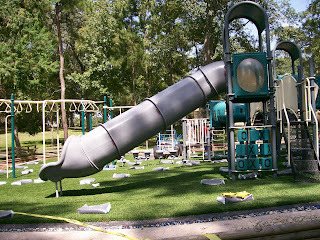 Here's a picture of the new turf at our neighborhood playground. We've watched them work on this project. They dug out all of the wood chips, leveled the ground, put in a layer of gravel, topped that with thick rubber matting, and then placed this "grass" on top. It looks nice, it's soft, and it's inhospitable to fire ants. It's a great kid-friendly improvement to our playground.